PITTSBURGH — Walls are what they are — big, dull dividers. With a few applications of conductive paint and some electronics, however, walls can become smart infrastructure that sense human touch, and detect things like gestures and when appliances are used. Researchers at Carnegie Mellon University and Disney Research found that they could transform dumb walls into smart walls at relatively low cost — about $20 per square meter –using simple tools and techniques, such as a paint roller. 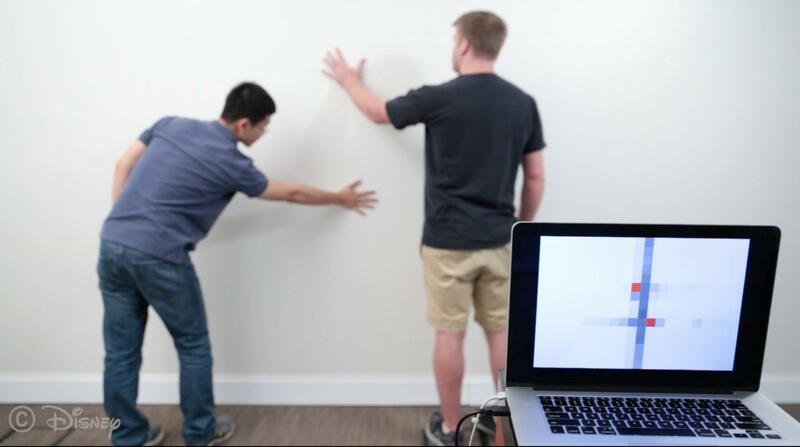 These new capabilities might enable users to place or move light switches or other controls anywhere on a wall that's most convenient, or to control videogames by using gestures. By monitoring activity in the room, this system could adjust light levels when a TV is turned on or alert a user in another location when a laundry machine or electric kettle turns off. "Walls are usually the largest surface area in a room, yet we don't make much use of them other than to separate spaces, and perhaps hold up pictures and shelves," said Chris Harrison, assistant professor in CMU's Human-Computer Interaction Institute (HCII). "As the internet of things and ubiquitous computing become reality, it is tempting to think that walls can become active parts of our living and work environments." Yang Zhang, a Ph.D. student in the HCII, will present a research paper on this sensing approach, called Wall++, at CHI 2018, the Conference on Human Factors in Computing Systems, April 21-26 in Montreal. The researchers found that they could use conductive paint to create electrodes across the surface of a wall, enabling it to act both as a touchpad to track users' touch and an electromagnetic sensor to detect and track electrical devices and appliances. "Walls are large, so we knew that whatever technique we invented for smart walls would have to be low cost," Zhang said. He and his colleagues thus dispensed with expensive paints, such as those containing silver, and picked a water-based paint containing nickel. They also wanted to make it easy to apply the special coating with simple tools and without special skills. Using painter's tape, they found they could create a cross-hatched pattern on a wall to create a grid of diamonds, which testing showed was the most effective electrode pattern. After applying two coats of conductive paint with a roller, they removed the tape and connected the electrodes. They then finished the wall with a top coat of standard latex paint to improve durability and hide the electrodes. The electrode wall can operate in two modes — capacitive sensing and electromagnetic (EM) sensing. In capacitive sensing, the wall functions like any other capacitive touchpad: when a person touches the wall, the touch distorts the wall's electrostatic field at that point. In EM sensing mode, the electrode can detect the distinctive electromagnetic signatures of electrical or electronic devices, enabling the system to identify the devices and their locations. Similarly, if a person is wearing a device that emits an EM signature, the system can track the location of that person, Zhang said. Wall++ hasn't been optimized for energy consumption, Zhang said, but he estimated the wall-sized electrodes consume about as much power as a standard touch screen. In addition to Zhang and Harrison, the research team included HCII Professor Scott Hudson, and Alanson Sample and Chouchang (Jack) Yang of Disney Research.